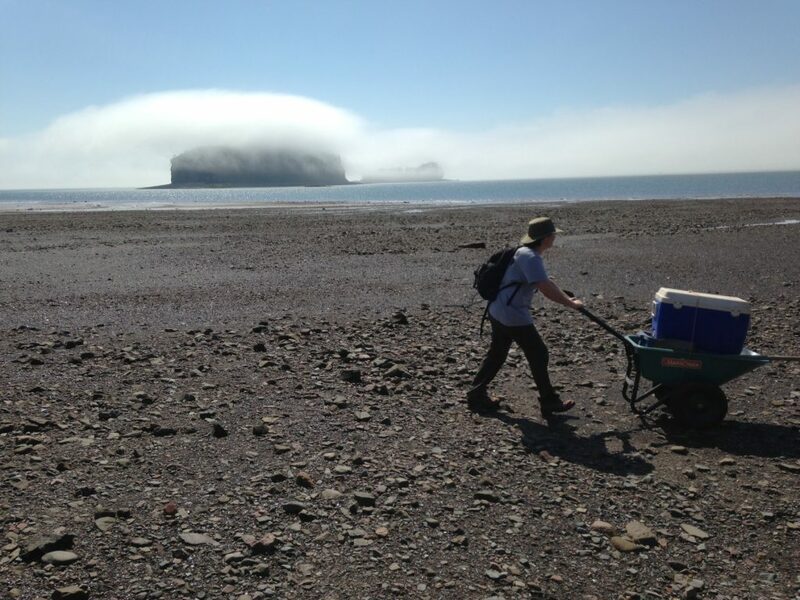 The Research Staff at the Fundy Geological Museum visit the Fossil Research Site at Wasson Bluff regularly through the year. The staff conduct field work to collect new fossils exposed by the tides, and also give public guided tours. As part of these visits a series of Panorama photographs have been captured. They are useful for monitoring erosion and identifying changes during the year. Below is an sliding image that allows you to see the changes in the cliff from May 2016 to October 2016. In October the trees have leaves and there has been some erosion along the shore but no major cliff changes or erosive events. Drag the slider from side to side to see the cliff change seasons from Spring to Fall. 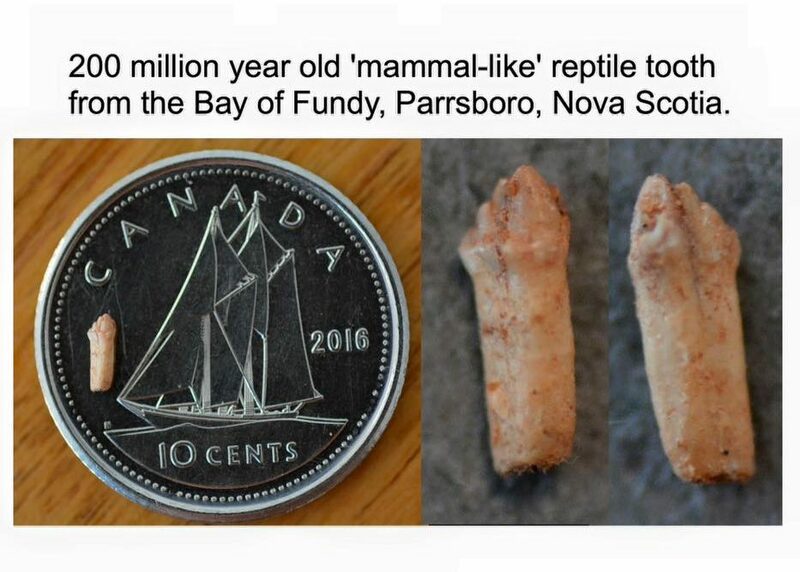 The field work done by research staff and volunteers at the Fundy Geological Museum in June to collect Bay of Fundy Jurassic fossils was very successful. Several new specimens were found and collected. These new specimens include portions of several lizard-like reptile (Clevosaurus) skulls, the tip of the snout (premaxilla) from a theropod dinosaur, and a tiny mammal-like reptile tooth. The Museum staff and volunteers have now returned to the research site to continue to look for more fossils that are 200 million years old. On Wedneday July 26, the team transported supplies and tools to the site. The initial supplies are transported to the site using a wheelbarrel. The morning fog along the shore provided a magical setting for the start of another visit to the research site. Soon after arriving, the team inspected the Jurassic aged fluvial (river) sandstone exposed at the site. Several new specimens were immediately found. After only a month that included a few rainstorms, several new specimens have become visible on the surface. Volunteers have been assisting with the finds as well. On Thursday, volunteers Mark and Jack helped to expose some of the new fossil specimens. Jack found a significant limb bone fragment and proved very adept at carefully removing the sandstone to expose the delicate fossils. The weather has been very hot! Wedge and Rex, the canine members of the research team, have enjoyed the shade of the tarp during the hottest parts of the day. Rex has demonstrated skills at digging in the sand – although he is still not sure what fossil bone looks like. Museum staff are also continuing to develop the sieving technique. The sandstone is dissolved in water and a screen is used to remove the sand and expose the small fossil bones. 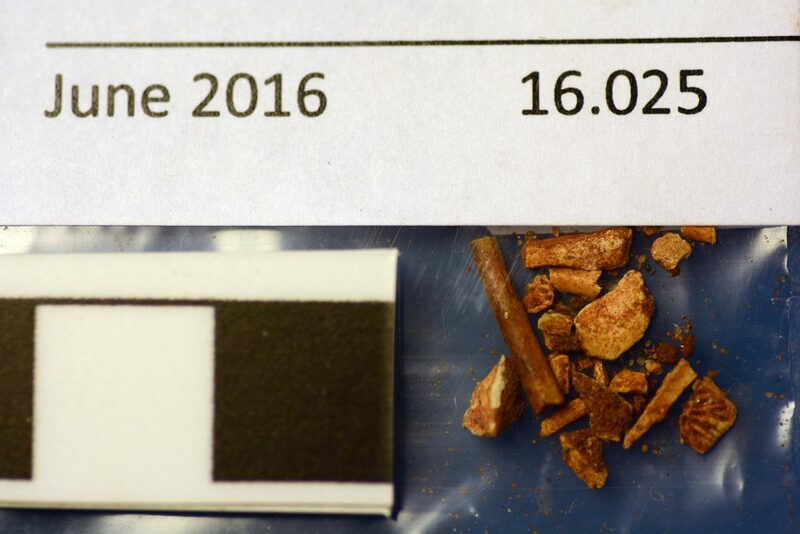 The technique is proving to be successful for locating small teeth and bones from the animals preserved in the sandstone. More updates will follow. You can also follow the progress of the research team by following the Museum’s Facebook Page. As Canada Day approaches there is an excitement in the air in Parrsboro, Nova Scotia. The Museum has recently completed the spring field work that was very successful. The Museum’s June field work had excellent weather. Sunny and warm for the entire week. Thank you to all the staff and volunteers that assisted with this years spring field work. 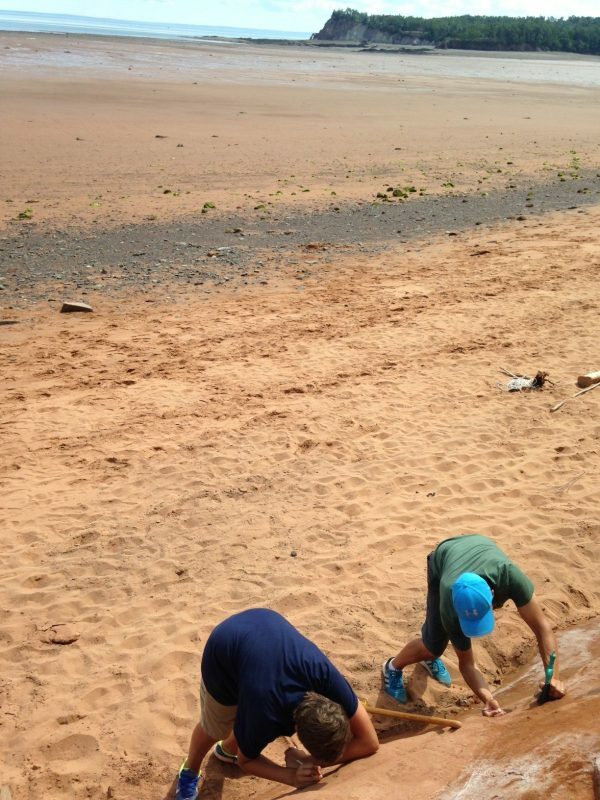 Wasson Bluff Research Site on Bay of Fundy Shore. Photo Credit – Amy Tizzard. The Museum’s field work was very successful. The field crew was able to collect over twenty five specimens of small bones and teeth from early dinosaurs, mammal-like reptiles, and the swift moving carnivore Protosuchus. The field work also produced a very rare Tritheledont postcanine tooth as well. The teeth and bones were deposited within banks and bottoms of a sandy river 200 million year ago. 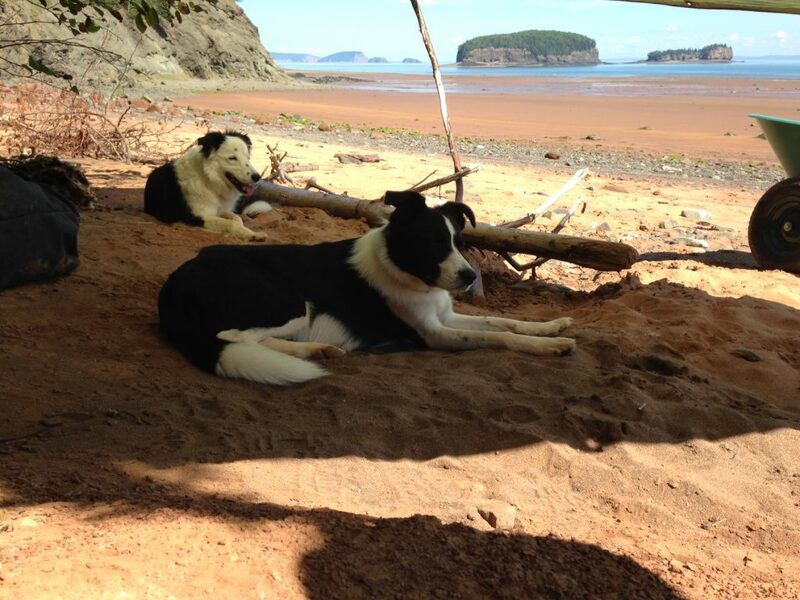 If they were not collected, they would have been lost to erosion from the massive Bay of Fundy tides. These bones are of scientific interest for they represent the survivors of a global mass extinction that happened as the supercontinent Pangaea broke apart.